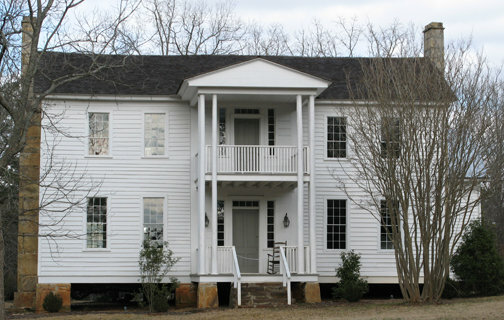 The Elisha Winn House was built about 1812 in the headright lands of Jackson County - six years before Gwinnett County was created. During this period, Elisha Winn was a Justice of Inferior Court in Jackson County from 1815 to 1817. Elisha, together with Roger and Elijah Pugh, purchased the 7,300 acre Jones tract on the Appalachee River from the Jackson County tax collector in 1809 of which this property was part. The property became part of Gwinnett County on December 15, 1818, when the Georgia legislature created the counties of Gwinnett, Walton, and Hall, in part from headright lands of Jackson County, but mostly from former Indian lands ceded to the State of Georgia. The headright lands from Jackson County were included as part of the new counties so that there would be enough people to hold elections and to begin the operations of government while the former Indian land could be distributed through a state lottery. As part of the newly formed county of Gwinnett, the Elisha Winn property gained historical significance because in this house much of the planning for the new county took place; and, here the first functions of county government were carried out. Inferior Court and the first county elections were held in the parlor, and by early spring of 1819, Gwinnett County had a full slate of elected county officials made up of a Sheriff, Clerk of Superior Court, Clerk of Inferior Court, Tax Collector, Tax Receiver, Coroner, and Surveyor. The first five judges of the Inferior Court were commissioned on February 2, 1819. Elisha Winn was commissioned a judge of the Inferior Court to succeed Samuel Reid on July 21, 1820, and served this position through 1825, becoming state senator from Gwinnett County in 1826, and a state representative from Gwinnett in 1830, 1833, and 1837. Early sessions of Superior Court (1819-1822), serving several counties including Gwinnett, were held in Elisha Winn's barn (the original barn no longer stands). Being the seat of such government functions, the first jail in Gwinnett County was also built at this site (the current jail is similar to the original and stands where the original first stood). The seat of government was relocated to the newly created city of Lawrenceville in 1821. The Winns moved from this property to Lawrenceville about 1824.